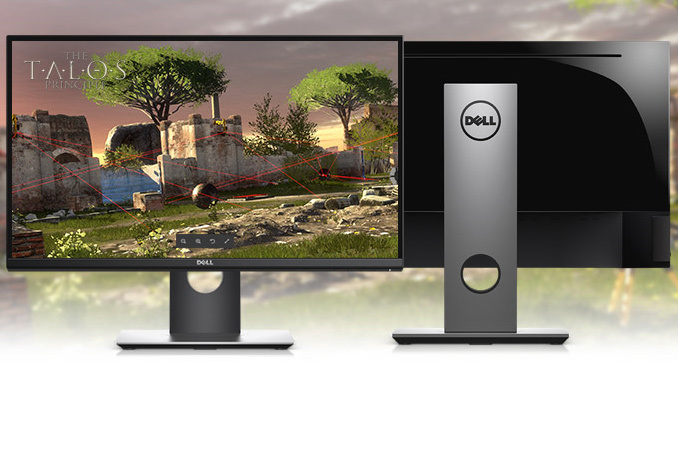 Dell has quietly expanded its lineup of gaming displays with two new monitors featuring dynamic refresh technologies from AMD and NVIDIA. One of the monitors uses a full-HD (1920x1080) IPS panel with a refresh rate up to 75 Hz, whereas the other has a WQHD (2560x1440) TN panel with a refresh rate up to 165 Hz. The products belong to the entry-level and mainstream segments. The Dell S2417DG is a monitor that the supplier recently added to its web-site in various locals but not via an official press release at this point. The S2417DG is based on a 23.8” TN panel with a 2560×1440 resolution, a peak brightness of 350 nits as well as a 1000:1 contrast. The key advantage of the S2417DG display for gamers is support for NVIDIA’s variable refresh rate G-Sync technology, allowing dynamic refresh rates between 30 and 165 Hz, which is a very decent range for a WQHD monitor. Moreover, with such high peak refresh rate, it is possible to use the monitor for stereoscopic 3D gaming using NVIDIA’s 3D Vision 2 glasses. Since this one uses a TN panel, this display is not aimed at professionals and exchanges refresh rate for color accuracy and viewing angles (it supports 170°/160° horizontal/vertical. For inputs, the monitor has DisplayPort and HDMI connectors to allow gamers to switch between a PC and a game console. In addition, the S2417SG has a quad-port USB 3.0 hub as well as an ultra-thin bezel for setting up multi-monitor arrangements. The price of the Dell S2417DG is not listed by the supplier, but TFTCentral reports that the product will cost $570 when it is available later this quarter, which is $100 below its bigger brother, the S2717DG. The very decent dynamic refresh rate range between 30 and 165 Hz in the WQHD form factor is a large factor in the cost of the monitor. Up next is the Dell SE2717H, which the company recently added to its U.S. Hong Kong web-site. The monitor looks to be a budget solution for gamers, as it costs HK$1799 (about $232) in Hong Kong and does not boast a high-end specification. Right now, it is not completely clear when this monitor is set to be available in Europe, but in the U.S. it is going to be available starting from August 16 for $250. The SE2717H display is based on a 27” 1920x1080 IPS panel with a peak brightness of 300 nits as well as 178°/178° horizontal/vertical viewing angles. To appeal to gamers, it supports AMD’s FreeSync dynamic refresh rate technology in the range between 48 Hz and 75 Hz, which is standard for monitors in this class. The display has one HDMI 1.4 input (which makes it one of the first FreeSync-supporting screen with an HDMI input) as well as a D-Sub to connect to older PCs. The addition of AMD’s FreeSync technology to a budget display indicates that this feature should start to roll out to standard gaming monitors rather than a remaining premium capability. While the SE2717H is not the cheapest FreeSync-supporting monitor around, at 1080p with a 27” panel and a 75 Hz maximum refresh rate (as opposed to 60 Hz in case of cheap screens), theses advantages that are going to attract the attention of potential buyers. So we have an expensive 24" TN monitor with a decent resolution, but expensive GSync. And a cheap 27" IPS monitor with a rubbish resolution and 6-bit panel, but cheap Freesync. They may already have those monitors available. For example, they have a quite good gaming 27", 2440x1440, 144Hz, G-Sync TN monitor (I just bought one, for a TN monitor it's good...but it's a TN monitor, I only use it for gaming :)). This is a couple of new entries in their line-up.